Gregory Stillman Professor of Electrical and Computer Engineering Jean-Pierre Leburton has been selected by the Institute of Electrical and Electronics Engineers for IEEE Life Membership. This special honor is awarded to individuals in the association who have exhibited leadership, volunteerism and dedication to advancing technology for humanity. Life Member Status recognizes Leburton’s outstanding achievements and research that have made a significant impact on the growth and development of IEEE. Leburton has been distinguished as one of the most active, engaged, and influential volunteers within IEEE. He will help with the development of standards as well as hold leadership positions at all levels of the organization. Life members serve as reviewers, editors, and conference organizers. Leburton is an expert in the theory and stimulation of semiconductor devices and low-dimensional systems. 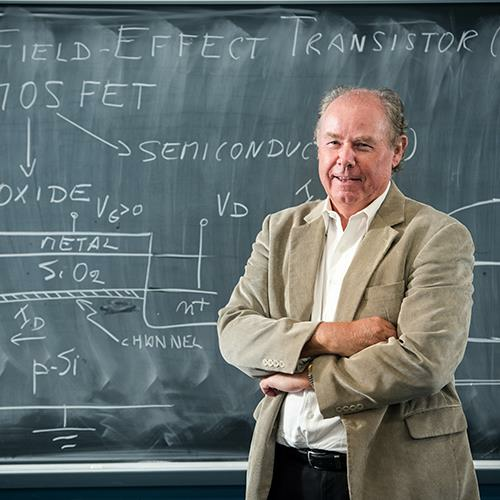 His research focuses more specifically on transport and optical processes in semiconductor nanostructures such as quantum wells, quantum wires and quantum dots. Currently, his research projects involve electronic properties of self-assembled dots for high performance lasers, single-electron charging and spin effects in quantum dots, modeling of nanocrystal floating gate flash memory devices, nanoscale Si MOSFET’s and carbon nanotubes and graphene nanostructures. In the last few years, he turned his interest toward the interaction between living systems and semiconductors to investigate programming and sensing biomolecules with nanoelectronics.